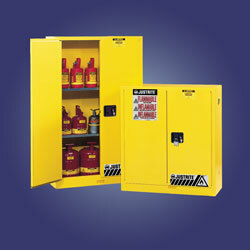 Industry-leading Justrite Safety Cabinets offer safe, dependable, flammable liquid storage and protection. Safety storage cabinets serve critical functions. They safely contain hazardous chemicals to reduce the risk of fire, protecting both personnel and facilities; Identify, organize, and segregate dangerous liquids; Offer compliance with federal OSHA regulations and the National Fire Protection Agency; Improve efficiency by allowing solvents to be stored near points of use; Improve security with keyed locking mechanism or padlock; and Alert firefighters to the location of hazardous liquids so they can be properly addressed under fire conditions, reflective labeling helps firefighters quickly spot hazards under dark or smoky conditions. With the new and improved Sure-Grip EX® line of flammable storage cabinets, you et the same factory leading quality you have come to expect with the Justrite name, plus the added safety features the new Haz-Alert™Reflective labeling to provide high visibility in the dark under fire condition or power outages when illuminated by a flashlight beam, the New Stainless Steel, three-point bullet self-latching system to provide easy, fail-safe positive door closure with increased heat resistance, new exclusive SpillSlope™ safety shelves direct spills to the back and bottom of the leak proof sump, New Haz-Alert™ safety Band is a firefighter friendly reflective band at the bottom to alert firefighters when crawling in smoke-filled areas and the new exclusive U-Loc™ pad lockable handle - the optional padlock allows for extra security and key coding multiples for convenient access. The flush paddle handle with slip resistant grip offers easy fingertip operation and reduces dangerous "catches" from passing traffic. Double key set included for keyed lock. All models comply with OSHA 29 CFR 1910.106 and NFPA Code 30, section 6.3.3. Most models are FM approved. Please click here Justrite Webiste for all models.